Life Flight Network, the largest non-profit air medical transport service in the United States that is based out of Aurora, is celebrating its 40th anniversary and offering $40 new memberships in honor of its 40 years of service to communities across Oregon, Washington, Idaho and Montana. "Since 1978, Life Flight Network has provided air medical transport service to people in the Pacific Northwest, saving lives and saving valuable time when every second counts," said Life Flight Network CEO Michael Griffiths. "It is our privilege to continue to serve the region alongside hospitals and the emergency response community." To celebrate its 40 years of service, Life Flight Network will offer $40 annual memberships — for new members only — through Labor Day. Members incur no out-of-pocket expense if flown for medically necessary emergent conditions by Life Flight Network or one of their reciprocal partners. Membership covers the primary membership holder, their spouse or domestic partner, and dependents claimed on their income tax return. Elderly and disabled family members living in the same household can also be covered. Memberships are normally $65. To enroll, visit www.lifeflight.org/membership www.lifeflight.org/membership or call the Life Flight Network membership office at 800-982-9299. Started in 1978 as Emanuel Life Flight, the program was owned and operated by Emanuel Hospital (now Legacy Emanuel Medical Center). 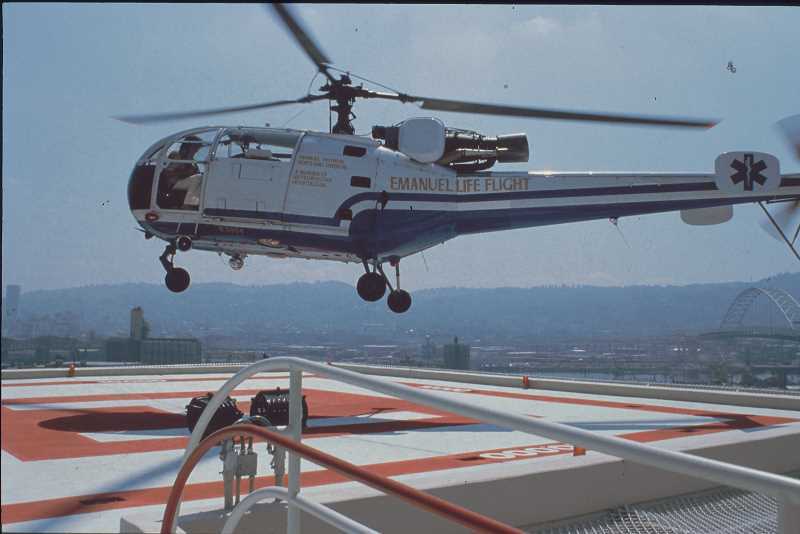 Emanuel Life Flight was one of the first hospital-based air ambulances on the West Coast and only the fourth in the nation. Transporting 121 patients in its first year, a French-made Allouette-3 helicopter was the program's inaugural aircraft. Yachats Fire Chief Frankie Petrick activated the first Emanuel Life Flight transport. "In more than 40 years with the Yachats Fire Department, I've worked closely with Life Flight Network in situations where having access to air ambulance transport meant the difference between life and death," said Petrick. "Life Flight Network has served our region well and since my first call to Emanuel Life Flight in 1978, they've always been there when we needed them." Today, Life Flight Network is a nationally recognized air medical transport service with more than 550 employees and 25 bases covering a large part of Oregon, Idaho, Washington and Montana. Life Flight Network's core mission is to serve the community by providing ICU-level critical care transportation to ill or injured patients in a safe, compassionate, efficient and expeditious manner. Life Flight Network recently released a new app called LFN Respond that allows hospitals and first responders to call for a life-saving air ambulance transport with the touch of a button. The consortium of Oregon Health & Science University, Legacy Emanuel Medical Center, St. Alphonsus Regional Medical Center and Providence Health & Services own Life Flight Network.